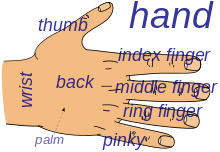 Fingers contain some of the densest areas of nerve endings on the body, and are the richest source of tactile feedback. They also have the greatest positioning capability of the body, thus the sense of touch is intimately associated with hands. Like other paired organs (eyes, feet, legs) each hand is dominantly controlled by the opposing brain hemisphere, so that handedness—the preferred hand choice for single-handed activities such as writing with a pencil, reflects individual brain functioning. 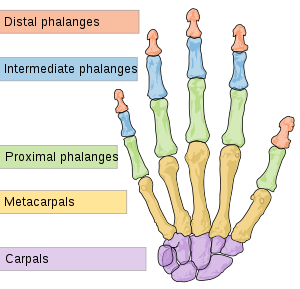 The human hand has five fingers and 27 bones, not including the sesamoid bone, the number of which varies between people, 14 of which are the phalanges (proximal, intermediate and distal) of the fingers. 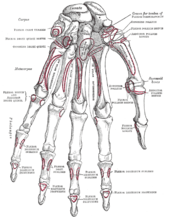 The metacarpal bones connect the fingers and the carpal bones of the wrist. 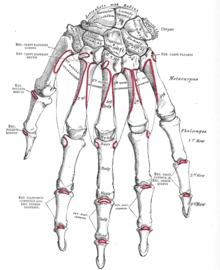 Each human hand has five metacarpals and eight carpal bones. Among humans, the hands play an important function in body language and sign language. The glabrous (hairless) skin on the front of the hand, the palm, is relatively thick and can be bent along the hand's flexure lines where the skin is tightly bound to the underlying tissue and bones. 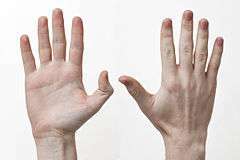 Compared to the rest of the body's skin, the hands' palms (as well as the soles of the feet) are usually lighter — and even much lighter in dark-skinned individuals, even compared to the other side of the hand. Indeed, genes specifically expressed in the dermis of palmoplantar skin inhibit melanin production and thus the ability to tan, and promote the thickening of the stratum lucidum and stratum corneum layers of the epidermis. All parts of the skin involved in grasping are covered by papillary ridges (fingerprints) acting as friction pads. In contrast, the hairy skin on the dorsal side is thin, soft, and pliable, so that the skin can recoil when the fingers are stretched. 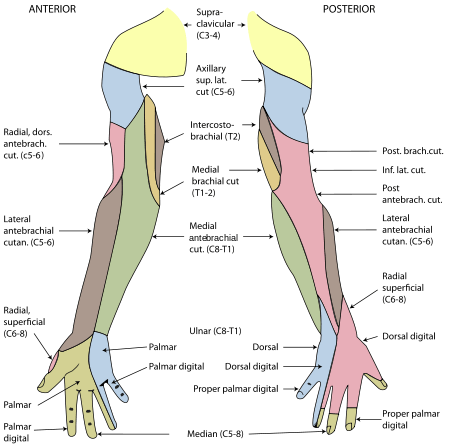 On the dorsal side, the skin can be moved across the hand up to 3 cm (1.2 in); an important input the cutaneous mechanoreceptors. A number of genetic disorders affect the hand. 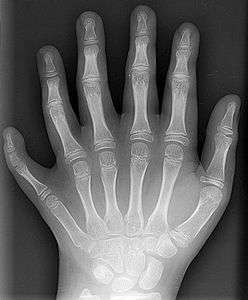 Polydactyly is the presence of more than the usual number of fingers. One of the disorders that can cause this is Catel-Manzke syndrome. The fingers may be fused in a disorder known as syndactyly. Or there may be an absence of one or more central fingers—a condition known as ectrodactyly. The autoimmune disease, rheumatoid arthritis can affect the hand, particularly the joints of the fingers. Some conditions can be treated by hand surgery. These include carpal tunnel syndrome a painful condition of the hand and fingers caused by compression of the median nerve, and Dupuytren's contracture a condition with fingers bending towards the palm that cannot be straightened. A similar condition to this is where some of the fingers cannot be flexed due to injury to the ulnar nerve. A common fracture of the hand is a scaphoid fracture—a fracture of the scaphoid bone, one of the carpal bones. This is the commonest carpal bone fracture and can be slow to heal due to a limited blood flow to the bone. There are various types of fracture to the base of the thumb and these are known as a Rolando fracture, Bennet's fracture and Gamekeeper's thumb. 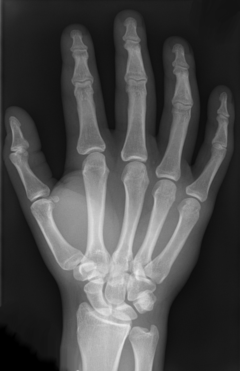 Another common fracture is to the neck of a metacarpal, known as Boxer's fracture. 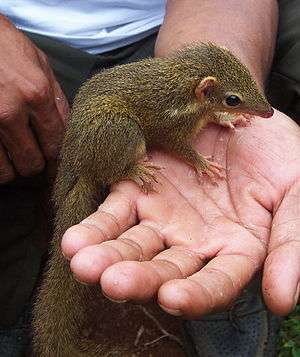 The prehensile hands and feet of primates evolved from the mobile hands of semi-arboreal tree shrews that lived about 100 million years ago. This development has been accompanied by important changes in the brain and the relocation of the eyes to the front of the face, together allowing the muscle control and stereoscopic vision necessary for controlled grasping. This grasping, also known as power grip, is supplemented by the precision grip between the thumb and the distal finger pads made possible by the opposable thumbs. Hominidae (great apes including humans) acquired an erect bipedal posture about 3.6 million years ago, which freed the hands from the task of locomotion and paved the way for the precision and range of motion in human hands. Functional analyses of the features unique to the hand of modern humans have shown that they are consistent with the stresses and requirements associated with the effective use of paleolithic stone tools. It is possible that the refinement of the bipedal posture in the earliest hominids evolved to facilitate the use of the trunk as leverage in accelerating the hand. There is a hypothesis suggesting the form of the modern human hand is especially conducive to the formation of a compact fist, presumably for fighting purposes. The fist is compact and thus effective as a weapon. It also provides protection for the fingers. 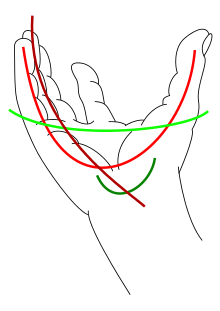 Although this is not widely accepted to be one of the primary selective pressures acting on hand morphology throughout human evolution, with tool use and production being thought to be far more influential. Done by hand or manually, means not using machinery or electronics to fulfill a function or action. Palmistry the art of fortune telling and medical diagnoses by the form of lines and shapes on the palm of the hand. Mudra a Hindu term for a hand gestures bearing some significance to one form of expression or another. Kivella, Tracy L.; Schmitt, Daniel (August 25, 2009). "Independent evolution of knuckle-walking in African apes shows that humans did not evolve from a knuckle-walking ancestor". PNAS. 106 (34): 14241–14246. Bibcode:2009PNAS..10614241K. doi:10.1073/pnas.0901280106. PMC 2732797 . PMID 19667206. Putz, RV; Tuppek, A. (November 1999). "Evolution of the hand". Handchir Mikrochir Plast Chir. 31 (6): 357–61. doi:10.1055/s-1999-13552. PMID 10637723.